This particular book took me entirely too long to get off my "to-read" list. I have been listening to librarians and patrons rave for years about this series, but for some reason, I just couldn't talk myself into reading. Maybe because of a talking dog? Or the uber-hype? That has come back to bite me before. The premise is unlike anything I've read before. I was pretty confused at the beginning, trying to piece together what I thought could be happening with a unique and disturbing setting. As the pieces of the puzzle came together, I was genuinely impressed with the author's creativity and terrifying storytelling. A major plot point each character's ability to hear "noise"...the thoughts and inner musings of every single other person and creature around. While Ness shows the destructive nature of such an ability, it's an overwhelming tool, slowing down the pace of the book and making it difficult to really like any of the characters. Overall, a successful science fiction tale. Patrick Ness has created an interesting, exotic setting that, while you would never want to visit, you'd kind of like to know a little more about. 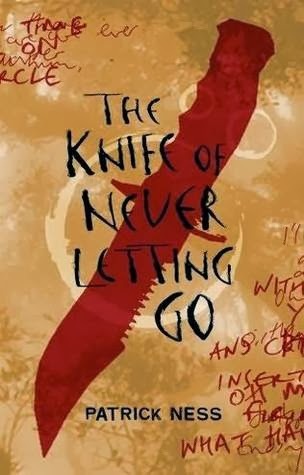 If you're looking for a few thrills, a world re-imagined, and the ability to hear what a dog is thinking, check out The Knife of Never Letting Go.